Info: It exists differents versions for C64/128, the last was the Final Carridge 3. The "Final Cartridge 3" is a cartridge, which can be operated on the Expansion port of the C64 or the C128. It was developed in 1987 from the company RISKA B.V. Home & Personal Computers (based in: Rotterdam in the Netherlands). 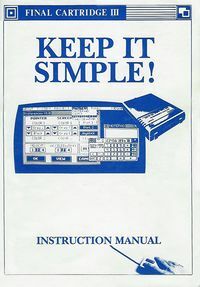 It provides over 60 new functions to the C64-user (e.g. BASIC-Extension, Fastloader and -saver for the 1541 with an acceleration factor of 10, Freezer, Monitor). Additionally there is a graphical user interface (Desktop) with windows (similar to GEM or Windows). From the hardware there is a Reset- and a Freezer-Function. The 1581 is not supported. 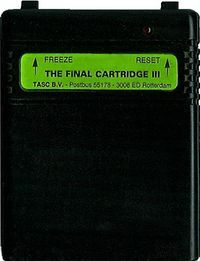 2 Functions of the "Final Cartridge 3"
This is the most thorough deactivation. Games which will refuse to start and where also a BASIC-KILL will not help should be treated following: Load normally, LIST, memorize SYS-Adress, call freezer, FINAL KILL, then enter SYS manually. 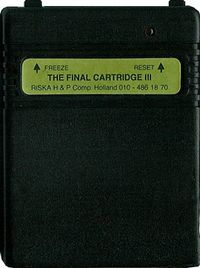 Functions of the "Final Cartridge 3"
All additional functions are only usable, if the "Final Cartridge 3" is active. Apart from the Expansion port connector and the red LED, the cartridge has two push-buttons for the reset and the freezer-function. The cartridge prevents changing the Interrupt vector in BASIC direct mode. Due to this, many utilities that hook into the interrupt will not work. Keyboard: <F1>,<F3>,<F5>,<F7> for the directions and <C=> to select. Mouse: Attention - With the old Version of the "Final Cartridge 3", only in joystick mode (press right mouse key on the mouse 1351 during power on!). DESKTOP: Display the authors and developers of the "Final Cartridge 3"
VERSION: Display the manufacturing date and Version number of the "Final Cartridge 3"
BASIC: Terminates the desktop and switched to the usual C64-screen. FINAL KILL: Switches off the "Final Cartridge 3". PREFERENCES: Settings like screen color, pointer color, pointer speed or joystick control. TAPE: Call the tape functions SLOW (load a program) and FAST (fast loader, i.e. 10 times faster as the standard load routine). ALARM: Toggle the alarm function. With the freezer-function you can freeze running programs and save the memory content to Diskette or Datasette. This serves amongst others to create personal backups or to print out screens (hardcopies) in b/w or color. The hardware of the FC3 has several functions. First, it should enable the access to the 64k ROM. There exists a register at the address $DFFF in the IO2-Area of the C64, which enables it to control mapping 16k or 8k areas of the ROMs to the C64 memory. Second it enables it to select 16k banks from the 64k FC3-ROM. 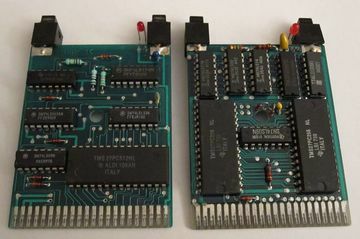 To provide these functions, in this register are bits to control the status of the lines GAME and EXROM of the C64, the address lines A15 and A14 of the EPROMs and the LED of the cartridge. A14 and A15 can be read out indirect via $DE00. Although there is no register, the FC3-ROM contains at this address the value, which would be under normal conditions at the address $DFFF-register. There are two different versions of the hardware known to exist. One with two 27256 EPROMs and few extra logic, and another one with a 27512 EPROM and several TTL-chips. To which extent these are functionally different is not known. However, the register at $DFFF seems to be identical. The TTL-chips of the 27512 EPROM version: 74LS09, 74LS14, 74LS133, 74LS174, 74LS163. The TTL-chips of the 2x27256 EPROM version: 74LS00, 74LS09, 74LS14, 74LS133, 74LS174, 74LS163. One good thing more of the FC3 and its Fastloader is, that it is compatible to the SD2IEC and some of its Filebrowsers, like for example CBM-Browser or SD2BRWSE. This means, the FC3-Fastloader stays alive in this browsers and loads all software faster. All singlefile prg-files works with it and also about 90% of the m2i-files. If a game do not like the FC3-fastload, then you can simply load the first file with fastloader and then type "kill" in the Basicscreen. Now FC3 is deactivated and the rest of the loading works normal. Also the F-key shortcuts of the FC3 and his simplified CBM-DOS-commands makes working with a SD2IEC much easier. The Final-Cartridge-3 and the SD2IEC build a very good and comfortable combination. This page was last modified on 19 September 2016, at 02:14. This page has been accessed 44,875 times.